At Mobile, Thomas L. Harrison, the hero on the confederate side in the Battle of Mobile Bay, died Friday night, aged fifty-one years. He graduated from Annapolis, and at the age of twenty years, he entered the confederate naval service. He was ordered to Mobile in 1862 and appointed executive office for the gunboat Morgan. Tennessee and the gunboat Selma having been captured and the gunboat Gaines burned. The captain of the Morgan gave orders to abandon the ship and set her on fire. Lieutenant Harrison, however, reminding the crew that this was the only free vessel in the bay and would be of incalculable value to the confederacy if saved, asked the men to volunteer to run the boat up to Mobile. Every man stepped to the starboard. Thereupon Harrison requested the captain to step below. Meaher State Park is a state park located in Spanish Fort, Alabama, a city in Baldwin County, Alabama. The park is accessed from the Battleship Parkway, also known locally as the Mobile Bay Causeway. 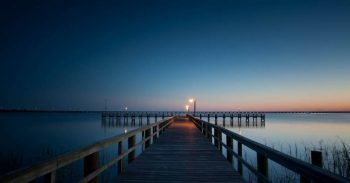 A scenic 1,327-acre park located in Spanish Fort offering a retreat for residents and visitors alike. With amenities for fishing, boating and camping, nature trails for hiking and exploring, as well as picnicking facilities, Meaher State Park is both an angler’s dream and a camper’s paradise. The park has a 300-foot pier with a 200-foot “T” for your fishing pleasure.